Cole Alpaugh's novel, THE BEAR IN A MUDDY TUTU, underscores and tosses a few exclamation points at the old adage about not judging books by their covers. The bear will lie and tell you this is a book for children, but dare to crack the spine and you'll find a work of literary fiction, most definitely for grown-ups. If pushed to single out the protagonist of TUTU, I'd probably point to the first character we meet, Buddy Wayne Hooduk. He's damaged goods right out of the box, his psyche used as a door mat for his mother to wipe her feet on. Pushed to breaking point, Buddy Wayne escapes his controlling mother and snatches up a how-to guide on becoming a cult leader. That's when his life begins in earnest. Just as we've settled into Buddy Wayne's shoes, the scenery changes. Others step into focus and tell their heart-wrenching tales. The journalist with a kidnapped child, a girl searching for her dead father, a career alcoholic haunted by his dreams. Each of them, like Buddy Wayne, is their own kind of broken. I won't dig any deeper here; the discovery of story is so personal, each of us bringing our own baggage to join us in our reading spots. This book is about things lost and other things found. Which is the way life really is. Flip to that first page. There's a story inside, both charming and heartbreaking. 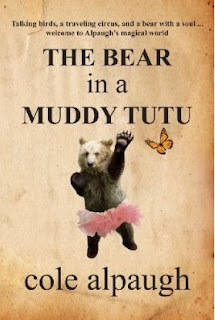 You can buy THE BEAR IN THE MUDDY TUTU right here. Now go see Regan, because she's got chocolate-covered bacon (and other awesome things!) to give away. Sounds like an interesting read, will go look for the excerpt to read from. This looks like a great book! Thanks for the review. Bear in a tutu? What's not to love?! I'm guilty of judging books by there cover. Thanks for letting me know about this one. I definitely thought kid's book when I first saw it. I judge books by their cover...and I find the dancing bear quite intriguing. I can't wait to get my hands on this book! I suspect that if you liked TUTU, you'd also like THE ART OF RACING IN THE RAIN. It's told from the perspective of a dog who's greatest wish in life is for opposable thumbs. A writer and a work in progress. I write commercial fiction with a literary edge. Represented by Alexandra Machinist of Janklow & Nesbit. My debut novel WHITE HORSE is coming soon from Atria Books.